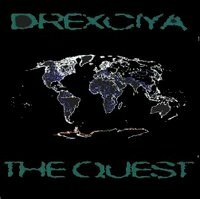 Drexciya's double CD and record compilation 'The Quest' came out in 1997 on Submerge. The collection takes its pick from the UR, Submerge and S.I.D. 12"'s of the previous five years. The only record not considered for inclusion here was 'The Journey Home' which came out on Warp and was probably not available to licence to them at this time. There are also a number of unreleased tracks. For some reason this release has always been a difficult one to track down in record shops. I myself can only ever remember seeing it for sale twice, a second-hand CD copy and a new vinyl set. Why this should ever have been the case I don’t know, I guess it would have had to be imported but so what, everything else seemed to turn up all the time. Did anyone else notice this? Today it’s long deleted and needless to say fetches big sums on Ebay. If anything by them should be reissued this album is surely crying out to be. By this stage Drexciya were taking a break from production and as far as I can tell only got involved to the extent of providing Submerge with the seven unreleased tracks and coming up with the album title. I was surprised at this realisation myself but when you study the artefact itself the evidence of this is there for all to see. First I’d like to tackle the unreleased music itself, although it really doesn’t expand on the concept. The ‘Intro’ on CD1 comes from the beginning of ‘Aquatacizem’ which one year later would be their contribution to UR’s ‘Interstellar Fugitives’ compilation. It’s worth mentioning that Drexciya would be listed on this album as still being MIA and their identifying image there would be what can only be described as a drawing of a biological limpet mine. Obviously that makes ‘Aquatacizem’ itself an outtake. I’m hoping to clean up some of the loose Drexciyan ends like this track in an article in the future so won’t go into any further detail here save to say the track itself doesn’t go on to explain what an ‘Aquatacizem’ is. Nevertheless I think we can figure it out for ourselves. A weird ancient alien type voice tells us what I think is “The people of Earth listen closely. We are attempting to avoid the Aquatacizem”. If you have been following the progress of their 12" releases to date they have given us warnings before but still this is an ambiguous beginning indeed which hinges on a mis-spelt word, business as usual! The next unreleased track on CD1 is track 3, ‘Dehydration’, which is a slow paced instrumental that sounds a lot like an Elektoids outtake to me. The next previously unheard track on this CD does not appear till the very end and is the pretty weird and hard to place in any period ‘The Mutant Gillmen’(An Experiment Gone Wrong)’. There is a vocal but its just a repeated sample that goes back and forth unintelligibly, some nice unexpected sounds going on here, but nothing amazing. CD2 offers up an instrumental version of ‘Living on the Edge’ and a choppy DJ style remix of ’Aquabahn’ as its first batch of unreleased fare but things get a lot more interesting when ‘Doctor Blowfins Water Cruiser’ turns out to be ‘Danger Bay’ from ‘Bubble Metropolis’. Quite what this means is open to debate, maybe the danger comes from Doctor Blowfin? This character is ever present and extremely ambiguous. ‘Dead Mans Reef’ is built around a repeating keyboard riff and ends literally stuck on a reef of bass. I guess the title is just one more of the many locations in Drexciya. I‘m also guessing that the ‘Reef Rhythms’(Bonus Beat) track on the vinyl is another version of this track. There is also a Bonus Beats version of ‘Depressurisation‘ on the vinyl set also. ‘Vampire Island’ boasts a really nice organ melody and again the title could be read as another location to flesh out the Drexciyan world. And no that is not your imagination, there is what sounds to me like a film sample saying “I am Count Dracula” I’ve always been struck by the similarity of the words Drexciya and Dracula, sharing as they do the same amount of syllables and similar spelling. Maybe this is a fun acknowledgement of that on their part, I think most people would on an initial listen imagine the sample says ‘Count Drexciya’ and maybe that’s what they want us to think, but listen closely and that is not the case. From ‘Dead Mans Reef’ on, the last four tracks are unreleased, the penultimate of which is the mysteriously titled ‘Neon Falls’. Sounding very grand, it’s a nice smooth instrumental number. The very suitably title ‘The Last Transmission’ finished out this CD and the album itself, an ok track, it does its thing and doesn’t outstay its welcome. With only a question mark to tell us of this tracks origins we are neatly being asked whether we have heard the last from Drexciya or not. Taking the album as a whole it’s an incredible body of work, the unreleased tracks take nothing away from it but don’t really add much either. The important thing is these tracks are collected in another format for people to now and in the future hear and wonder about. The text which covers the ‘Drexciyan Hand’ drawing which reaches out towards us from the depths explains the origins of Drexciya. But it’s important to note that it comes not from the hand of Drexciya but UR’s Unknown Writer. The four maps and their accompanying text which detail the history of African Americans from the slave trade through to techno spreading worldwide on the other hand is also more UR than Drexciya. The question is why exactly would they do this now when concept had previously been so important to them? It’s obvious by now that James Stinson was the main Drexciyan conceptualist and in the Brophy interview he revealed about this period, “I had health problems, and, to be honest I became seriously ill. It meant we had to shut things down for a while.” I guess this means he just took a back seat on the artwork etc and simply practised what he preached about letting other people interpret their music for themselves. I myself after-all am taking that stance as my own licence. The 4 maps and their texts follow on from this so here’s that in full too. Map 1.Atlantic Ocean, ‘The Slave Trade’ (1655 - 1867), Map 2. America, ‘Migration routes of rural blacks to Northern Cities’ (1930’s - 1940’s), Map 3. America, ‘Techno leaves Detroit and spreads Worldwide’ (1988), Map 4. Atlantic Ocean, ‘The Journey Home’, (Future). I would be very surprised if none of this had been passed by Drexciya themselves, no matter how 'shut down' things had become, so we can assume that to some extent they were ok with it. In the case of the origins at least they might have not only concurred but it may have come out of discussions they would have had with UR's Unknown Writer in a way similar to when he did his text for ‘Aquatic Invasion’. In fact in that text he mentions Drexciya taking a ‘return journey home’, this could certainly be read as a return to Africa, even ‘The Return of Drexciya’ in this context could also stand for a return to Africa. This is the great thing about the non-specifics of Drexciya, you can take it where you want to. As far as the whole slavery concept goes, the only quote I can source in which James Stinson said anything on this subject publicly was to John Osselaer when he said, "Some of the things of slavery will tell more when the time comes. Stay tuned! I can only tell you a little bit now. After the storm is over I will tell the story. What I can tell you is that in Africa we have a dimensional jump hole. Tell you more later." Sadly later never came, but this was him speaking in 2001 and refers to future concepts post ‘Grava 4’. So who knows what his own feelings were on this subject. I like the Unknown Writers take on it myself but it appears to be just that, his take on it. This also casts doubt on the final map which seems to answer the question ‘what is their quest?’, the future journey home to Africa. Again, fair enough if that’s how The Unknown Writer wants to read it that is his right. It’s just that what I have found and expounded on here in the eight releases leading up to ‘The Quest’ is not about anything as specific as a physical return journey to Africa but something far more universal, a journey which leads us to discover ourselves, no matter where we happen to live. It’s probably best if at this juncture restate my own interpretation. The whole thing is a journey, a quest, right from the opener ‘Deep Sea Dweller’ which signals our location, ‘Bubble Metropolis’ is the beginning of the detailing of this place we learn is Drexciya, we adapt to this new environment with ‘Molecular Enhancement’, we continue to explore in the ‘Unknown Aquazone’ but reach a point where to go any further we need to make a decision which is whether or not we wish to take ‘The Journey Home’, the nature of which we learn is spiritual. In ‘Aquatic Invasion’ we accept the challenge of becoming ‘Wave Jumpers’ before we can go any further down this path. In ‘The Return of Drexciya’ they reappear as the guides we must place our trust in as we lead our new ‘Uncharted’ lives. In my opinion their quest is the oldest one of all, to truly find ourselves, it is the same message no matter what our colour, creed or nation. I can’t help now but be reminded of The Unknown Writers ascending phrase of unity, ‘Nation 2 Nation, World 2 World, Galaxy 2 Galaxy’. The cover which depicts the globe of Earth comes from the map detail already mentioned, the back cover features a Drexciyan commando image last seen on the label of ‘Aquatic Invasion’. It’s a strange coincidence how the cover image for the Arpanet album ‘Wireless Internet’ is also a globe of the Earth, wonder if its designer was aware of its similarity? I know all this because a signed copy of the poster can now be found framed and hanging proudly in the office of Dublin’s D1 Recordings. Recently I saw it for myself and asked label head Eamonn Doyle about it. He explained that it was given to him while at the UR offices in 1997 and that James Stinson himself had been there and signed ‘Drexciya’ in large silver letters right in front of him. The 3 luminous green paint spots which look like thumbprints pressed into the bottom left hand corner , the mark of a Drexciyan, had already been there. D1 have had a relationship with UR dating from this initial contact, they are listed as allies on the UR website and have brought over many of the UR luminaries and also figures from the wider Detroit community to play, culminating to date in Galaxy 2 Galaxy headlining the D1 organised DEAF festival. There has even been an offshoot label, D1aspera, which was marketed, manufactured and distributed by UR themselves. Thankfully for us this was not the end and when Drexciya would finally return for real with ‘Neptune’s Lair’ in 1999 James Stinson(in 2001) looked back on this time with these words, “We take breaks to get away from everything and come back fresh. Basically, during that time where we took a break, inspiration, with the way things were going around here, it just wasn't right, you know. But it just came to a point where it was like 'we can't give it up'. We couldn't do that because it's in our blood, it's in our veins, we can't just get out of it, we can't stop doing what we do. So we decided 'Hey, we've got to go for it, we've got to do it, we've got to pick up the pace and come back and do what we do best." The long awaited ‘Neptune’s Lair’ is on its way, maybe not next. Hopefully it won’t take me 2 years to figure out!